Gregory Robert Freeman is a 26-year-old collector from Surrey, BC. His collection titled The Tudors & Stuarts consists mainly of English history and Protestant theology from the 16th and 17th centuries. He placed 2nd in this year’s contest, and once again I hope you will check out his essay and list once they have been published by the Bibliographical Society of Canada . 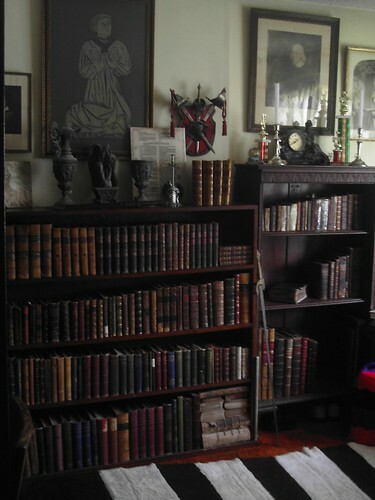 Mr. Freeman has been very active in Antiquarian collecting communities, maintaining the Olde Documents Repository and the Facebook group Antiquarian Book Collectors which I recommend checking out if you are so inclined! For a time I considered my first $200 purchase as the beginning of collecting rather than buying; but price gives a false impression. Paul Tronson, one of the world’s greatest restoration artists, gave me little bits of advice now and then to raise myself up and collect better books. Doing that was a process of trying to wean myself off cheap periphery items and focus on definite paths with original editions. Do you have a prefered method of acquiring books for your collection? For the most part I purchase from my main dealer who only does business by internet and fairs; he often makes acquisitions from London via online auction, and he’ll get something for me by request if I find anything. I search by keywords on abebooks, such as ‘vellum’ or ‘sermon’, etc., with a range of publication dates, and that often brings up some great items. If I’m in the mood for some adventure I’ll go to Vancouver to sift through the mountainous piles at MacLeod’s (they’re strictly brick & mortar). eBay and abebooks, etc., have had an enormous effect on book-collecting in the past ten years, and I think much of it good for both collector and seller. It’s rare nowadays that one can ever find an antiquarian bookstore that’s not online (like MacLeod’s). Collectors can pick and choose copies of a title now, where before they might have only found a single copy after decades of searching. A former-bookseller friend of mine (he was recently put out of business thanks to his landlord raising the rent by 50+%) said once to me that antiquarian shops cannot survive anymore without being online. I don’t necessarily agree with that; the larger high-end shops could survive offline very nicely I think, sending out catalogues, such as Maggs in London who has been in business for 160 years. But for the lower end shops, vintage, cheap ‘antique’ and modern all mixed together in a store, the internet has become necessary for many of them and a great source of added income – one that hopefully covers the rent each month. I resort to searching abebooks whenever I’m curious about a certain title and normally I find a copy. I also collect Mediaeval England and handwritten documents of the middle ages to 17thC. Naturally it’s unlikely that I’ll be able to acquire original material of the Saxon period (tho I will try); with the dissolution of the monasteries in the reign of Henry VIII tons of Saxon manuscripts were released, and some of those were published by the foremost collectors in the 16th-17thC, one being the Anglo-Saxon Chronicle in parallel Latin-Saxon edited by Gibson in 1692. The oldest piece of handwriting that I have so far in my Mediaeval document collection is a land grant from Essex dated to ca. 1270. Most of my documents are of the 16-17thC, typically land agreements, which I’ve taught myself to read; the handwriting on these is gorgeous, and most have wonderful initial letters. Another aspect of my library in general is a small collection of books once owned by prime ministers, with their bookplates, including Canadian PM’s Sir John A Macdonald and Sir Charles Tupper, and British PM Lord Rosebery. Your collection shows a great depth of knowledge about your subject matter – a subject which is pretty obscure to 21st century laymen. How do you go about researching your books? I research new acquisitions using other books of mine, with the occasional help from the internet. E.g., In attempting to find out more of Bishop Overall, I searched first the Athenae Oxonienses where I discovered he attended Cambridge, not Oxford, so I looked in the Athenae Cantabrigienses hoping to find him. I still couldn’t. Then it was pure chance that brought a new title, God’s Secretaries, to me, and lo and behold, there was plenty of information, which I compared and supplemented with findings online and in my other books. Overall is a very obscure name to even well read reformation enthusiasts, despite the fact he’s listed as being in the First Westminster Company for translating the King James Bible 400 years ago (of which he must have made a distracted effort, his wife had eloped with a certain gentleman at that time causing great scandal). It’s difficult to choose one specific book. Perhaps a Wycliffe bible handwritten ca. 1390 in contemporaneous binding with early ownership inscriptions (about 170 Wycliffe bibles are said to survive). This second contest I heard of from John Meier (Deacon Literary Foundation) while at the Vancouver Antiquarian Book Fair in October. After losing in the first contest a couple years ago I was far more cautious about everything, though I thought I still had a good chance. The months leading up to the deadline were exciting with nail-biting decisions on what major items to acquire on time. I’d say to read absolutely everything that comes your way in order to discover your favourite topics and various likes / dislikes. My collection started from buying everything 50-100 years old at a thrift store for 75 cents each, which progressed to older books from bookstores for $10-50 each, and so on. Collecting has been an enormous joy for me, reading, researching, and enjoying what I’ve gathered. For knowledge (even self-knowledge) it may be the most useful hobby in existence. Read my interview with 1st place winner Justin Hanisch here, and 3rd place winner Kieran Fox here!